For other uses of "mini", see mini (disambiguation). Mini (stylised as MINI) is a British automotive marque, owned by BMW since 2000, and used by them for a range of small cars. The word Mini has been used in car model names since 1959, and in 1969 it became a marque in its own right when the name "Mini" replaced the separate "Austin Mini" and "Morris Mini" car model names. BMW acquired the marque in 1994 when it bought Rover Group (formerly British Leyland), which owned Mini, among other brands. The original Mini was a line of British small cars manufactured by the British Motor Corporation, and its successors. Their models included the Morris Mini-Minor and the Austin Seven, the Countryman, Moke, 1275GT and Clubman. Performance versions of these models used the name Cooper, due to a partnership with racing legend John Cooper. The original two-door Mini continued in production until 2000. Development of a successor began in 1995 and the new generation car was launched in 2001. The current Mini range includes the Hardtop/Hatch/Convertible (three-door hatchback), Clubman (estate), Countryman (five-door crossover), Coupe/Roadster and Paceman (three-door crossover based on the Countryman). The Mini was originally a product of the British Motor Corporation, which in 1966 became part of British Motor Holdings. British Motor Holdings merged with Leyland Motors in 1968 to form British Leyland. In the 1980s, British Leyland was broken-up and in 1988 Rover Group, including Mini, was acquired by British Aerospace. In 1994, Rover Group was acquired by BMW. In 2000, Rover Group was broken up by BMW, with BMW retaining the Mini brand. The Mini Hatch/Hardtop, Clubman, Coupe and Roadster are assembled at BMW's Plant Oxford in Cowley, England. The Mini Convertible and Countryman are assembled at VDL Nedcar in Born (Netherlands), the Mini Hatch/Hardtop is also assembled here besides the Oxford plant. The Paceman was till 2016 assembled by Magna Steyr in Austria. A total of 301,526 Mini vehicles were sold worldwide in 2012. Mini vehicles have been active in rallying and the Mini Cooper S won the Monte Carlo Rally on three occasions, in 1964, 1965 and 1967. Mini has participated in the World Rally Championship since 2011 through the Prodrive WRC Team. In April 2013, Peter Schwarzenbauer became new Mini marque's managing director, succeeding Jochen Goller. The original two-door Mini was a small car produced by the British Motor Corporation (BMC) and its successors from 1959 until 2000. It is considered an icon of the 1960s, and its space-saving front-wheel-drive layout (which allowed 80% of the area of the car's floorpan to be used for passengers and luggage) influenced a generation of car-makers. The vehicle is in some ways considered the British equivalent to its German contemporary, the Volkswagen Beetle, which enjoyed similar popularity in North America. In 1999 the Mini was voted the second most influential car of the 20th Century, behind the Ford Model T.
This distinctive two-door car was designed for BMC by Sir Alec Issigonis. It was manufactured at the Longbridge and Cowley plants in England, the Victoria Park / Zetland British Motor Corporation (Australia) factory in Sydney, Australia, and later also in Spain (Authi), Belgium, Chile, Italy (Innocenti), Portugal, South Africa, Uruguay, Venezuela and Yugoslavia. The Mini Mark I had three major UK updates: the Mark II, the Clubman and the Mark III. Within these was a series of variations including an estate car, a pickup truck, a van and the Mini Moke—a jeep-like buggy. The Mini Cooper and Cooper "S" were sportier versions that were successful as rally cars, winning the Monte Carlo Rally four times from 1964 through to 1967, although in 1966 the Mini was disqualified after the finish, along with six other British entrants, which included the first four cars to finish, under a questionable ruling that the cars had used an illegal combination of headlamps and spotlights. 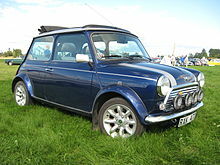 Initially Minis were marketed under the Austin and Morris names, as the Austin Seven and Morris Mini-Minor, until Mini became a marque in its own right in 1969. The Mini was again marketed under the Austin name in the 1980s. In the 1990s, BMW was seeking to broaden its model range through the addition of compact cars and SUVs. This sparked a series of compact car concept vehicles from the company during the early 1990s. The first were the E1 and Z13, powered by an electric motor and a rear-mounted 1100 cc BMW motorcycle engine, respectively. In early 1994, BMW acquired the Rover Group from British Aerospace, which owned Mini, among other brands. BMW insisted that even a compact model must feature traditional BMW characteristics (such as rear wheel drive) to uphold the company's standards and image. The "MINI" brand, however, did not share these standards and BMW saw this as an opportunity to create a competitively priced, yet premium, compact car. This formed BMW's plan to launch the premium BMW 1 Series and the mid-range Mini. It was at around this time that Rover, too, was working on a successor to the original Mini. Its first concept was the ACV30 which was unveiled at the 1997 Monte Carlo Rally. The name was partially an acronym of Anniversary Concept Vehicle, whilst the '30' represented the 30 years that had passed since a Mini first won the Monte Carlo Rally. The vehicle itself was a two-door coupe powered by a rear-mounted MG F engine. Just months later, Rover released another concept, this time, a pair of vehicles called Spiritual and Spiritual Too. These vehicles were a more realistic attempt to create a modern Mini, and coincided with BMW's official creation of the Mini project. Although the two-door and four-door pair wore Mini badges, both vehicles remained purely concepts. In July 2017, BMW has announced that an electric Mini model will be built at the Cowley plant, in Oxford, that will start production in 2019. It will also be produced in China. Launched in August 1959, the Mark 1 Mini (code name ADO 15) was initially marketed as the Austin Seven and Morris Mini-Minor. The Mini received some minor modifications in 1967 as sold as the Austin or Morris Mini in most markets. The Mark III Mini was launched in 1969, which was an updated version of Mark II with a modified bodyshell. The most visible changes were larger doors with concealed hinges. The boot lid lost the original hinged number plate and its recess shape and a large rear colour-coded lamp was fitted in its place, along with larger rear side windows. Sliding windows were replaced with winding windows—although some Australian-manufactured Mark I Minis had adopted this feature in 1965 (with opening quarterlight windows). The suspension reverted from Hydrolastic to rubber cones. as a cost-saving measure. Production at the Cowley plant was ended, and the simple name "Mini" completely replaced the separate Austin and Morris brands. The Mark IV, launched in 1976, introduced a front rubber mounted subframe with single tower bolts and larger bushes in the rear frame. In addition twin stalk indicators were introduced with larger foot pedals, and from 1977 onwards the rear indicator lamps had the reverse lights incorporated in them. The Mark V, launched in 1984, introduced 8.4-inch (210 mm) brake discs and plastic wheel arches (mini special arches) but retained the same Mark IV body shell shape. For the Mark VI, launched in 1990, the engine mounting points were moved forward to take 1,275 cc power units, and includes the HIF carburettor version, plus the single point fuel injected car which came out in 1991. The 998 cc power units were discontinued. Internal bonnet release were fitted from 1992. The Mark VII, launched in 1996, was the final version of the original two-door Mini. For this model twin point injection with front-mounted radiator was introduced, along with a full-width dashboard and driver's side airbag. All Mini models since 2001 have different variants, including One (entry-level), Cooper, Cooper S (sporty), and John Cooper Works (JCW) (high-end). The hatchback/hardtop Mini was the first model of the new generation Mini, introduced in 2001, and was back then known as simply Mini. It was available in Cooper, Cooper S and One variations at launch. In many European markets, the Mini One was powered by a 1.4 litre I4 version of the Tritec engine but all other petrol powered Minis used the 1.6 litre I4 version. The Mk I Mini One, Cooper and Cooper S used some version of the reliable, Brazilian-built Tritec engine, co-developed by Chrysler & BMW; the Mini One D used a Toyota-built 1ND-TV diesel engine. In August 2006, BMW announced that future engines would be built in the UK, making the car essentially British-built again; final assembly took place at Oxford, and the body pressings were made in nearby Swindon at BMW's Swindon Pressings Ltd subsidiary. The last Mk I variant was the Mini Cooper S with John Cooper Works GP Kit: a light-weight, quasi-race-prepped John Cooper Works model. Hand-finished by Bertone in Italy, it was offered as a limited-production run of 2,000 cars during the 2006 model year, with 444 of those originally intended for the UK market (although ultimately, 459 were sold). At the 2004 Salon International de l'Auto, Mini introduced a convertible model which was released in the 2005 model year and available in One, Cooper and Cooper S trim versions. The convertible roof is fully automatic—an unusual feature in such a small car—and can be opened partially to act as a sunroof whilst the car is driving at speed. The convertible model forsakes the rear hatchback of the Hardtop Mini, replacing it with a drop down 'tailgate' that is reminiscent of the classic Mini—it incorporates similarly prominent external hinges, and with the roof in the closed position, the rear roof section and luggage shelf can be raised with two handles, semi-tailgate style, to access the luggage space easier. The convertible also adds two small power windows for the rear seat passengers which are lowered automatically when the roof opens. The roof is made from a heavy cloth, with many layers of insulation; the rear window is glass with an integral heater/defroster, but no washer or wiper. At the 2007 North American International Auto Show, Mini introduced the limited edition Mini Cooper S Sidewalk Convertible. It had a top speed of 215 km/h (134 mph) and accelerates from 0 to 100 kilometres per hour (0 to 62 mph) in 7.9 seconds. The engine provides 168 hp (125 kW) and 220 N⋅m (160 lbf⋅ft) of torque. A 2009 Mini Cooper Hatch. Mini introduced an all-new second generation of the Hardtop/Hatch model in November 2006, on a re-engineered platform incorporating many stylistic and engineering changes. It utilises the Prince engine, the architecture of which is shared with PSA Peugeot Citroën and is designed to be more cost-effective and fuel-efficient, and is manufactured at the BMW Hams Hall engine plant in Warwickshire, United Kingdom. The development and engineering was done in Munich, Germany at BMW Group headquarters, and by external third parties. Although the new model looks very similar to its predecessor, every panel was different and new safety requirements resulted in the overall length increasing by 60 mm (2.4 in). The second generation Mini was introduced in the Cooper and Cooper S trim levels; the range was added to in 2007 with the Mini One. For the first time, there was a diesel-powered Cooper, available from April 2007, and badged as the Cooper D, which was supplemented in January 2011 with a new 2.0 L diesel for the automatic Cooper and high performance Cooper SD. The Convertible and Clubman versions followed later. In 2009, the Mini First trim level was launched in the UK, which is a low-end, petrol-only version, with less power and a lower speed. The Mini John Cooper Works Challenge is a purpose-built race car, based on the Mini Hatch, and manufactured in the BMW Motorsport factory located in Munich. It was unveiled in 2007 at the IAA Motor Show. In 2009 a John Cooper Works World Championship 50 special edition was unveiled in 2009 Mini United Festival in Silverstone. 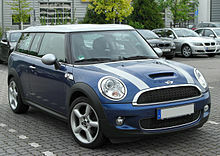 The Mini Clubman is an estate Mini, introduced for the 2008 model year and available in One, Cooper, Cooper S, and Cooper D variations. While identical to the Hatch/Hardtop from the B-pillars forward, the Clubman is 240 mm (9.4 in) longer overall, with a correspondingly stretched wheelbase that is 80 mm (3.1 in) longer; this provides more rear-seat leg room and substantially increased cargo space when compared to the Hardtop—160 mm (6.3 in) longer, giving 260 litres (9.2 cubic feet) of space. It has twin "barn doors," alternately referred to as "the Splitdoor," enclosing the boot instead of a pull-up hatch, and also features a "Clubdoor" on the right-hand side regardless of the intended market. This means that in right-hand drive markets, the rear door is on the road side of the car, requiring rear passengers to exit into the road. Engine and transmission selections are identical to those used in the Hatch/Hardtop model, except the 66 kW (90 PS; 89 hp) One Diesel; and the rear suspension set-up shares many of the same designs features including the rear trailing arms and the anti-roll bars. The use of the name "Clubman" for the Mini estate van was a break with classic Mini tradition. "Clubman" was originally the name given to the 1970s face-lift of the classic Mini, which mostly resulted in a squared-off front end, whereas the classic Mini estates had traditionally been named "Traveller" or "Countryman". However, BMW did not initially purchase the rights to use those names. The second generation Mini Convertible was unveiled at the 2009 Detroit Auto Show and the 2009 Geneva International Motor Show as a 2009 model-year vehicle (first available for sale on 28 March 2009). A device, marketed as the "Openometer", records the number of minutes the vehicle has operated with its roof retracted. Available variants and corresponding powertrain selections are the same as in the Mini Hatch range, including the diesel engine in some markets. The Mini Countryman was announced in January 2010, and formally launched at the 2010 Geneva Motor Show. It is the first Mini crossover SUV, and the first five-door model to be launched in the BMW-era. It is offered with a choice of two- or four-wheel drive (known as ALL4), and with 1.6 L petrol or diesel and 2.0 L diesel four-cylinder engines in various states of tune. Sales started in September 2010 as a 2011 model-year vehicle. The Countryman has a longer wheelbase, more interior room, and higher ground clearance than the Clubman. It uses the same engines as the Hatch/Clubman range, but with an optional all-wheel-drive powertrain (dubbed "ALL4") to allow minimal off-road and rugged terrain driving. A six-speed manual transmission is standard on all models, with automatic transmission available on all petrol and diesel models except the 90 bhp One D.
Mini revealed the Coupé in June 2011. It is the first two-seat Mini and the first to have a three-box design; the engine compartment, the passenger compartment and the luggage compartments are all separated. It will also be the fastest production Mini ever: in John Cooper Works trim, it does 0 to 62 mph (0 to 100 km/h) in 6.4 seconds and goes on to a top speed of 149 mph (240 km/h) as it is powered by a turbocharged 208 hp (155 kW) 1,598 cc four-cylinder. The Mini Roadster was first shown at the Frankfurt Motor Show in September 2009 and is the convertible version of the Mini Coupe. The Roadster is available in three trim levels: Cooper, Cooper S, and John Cooper Works. The Mini Paceman three-door crossover version of the Countryman debuted as a concept car at the 2011 Detroit Auto Show. On 5 July 2012, senior vice president of Mini brand management, Dr. Kay Segler, announced that, "the Mini Paceman is the official name of the brand's seventh model, which will be launched next year (2013) in the U.S." The production version was launched at the 2012 Paris Motor Show, with sales starting in most international markets by the second quarter of 2013. The third generation Mini was unveiled by BMW in November 2013, with sales starting in the first half of 2014. The new car is 98 mm longer, 44 mm wider, and 7 mm taller than the outgoing model, with a 28 mm longer wheelbase and an increase in track width (+42 mm front and +34 mm rear). The increase in size results in a larger interior and a boot volume increase to 211 litres. The original Mini was designated ADO 15, the 15th model developed by the Austin Drawing Office. ADO 20 is the code name to the Mini Mark III. The 1961 Cooper was referred to code ADO 50. 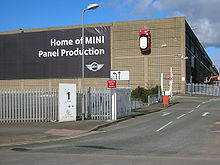 Plant Oxford in Cowley, Oxford, United Kingdom, the main assembly plant for the Mini range. Before BMW's ownership, the traditional Mini had been made at both Cowley, Oxfordshire and Longbridge, Birmingham. In time, production was rationalised to just Longbridge and so this was where the last of the cars were made, making Longbridge the "natural home" for the new Mini prior to BMW splitting up the company. 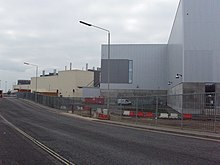 However, as a result of the change of ownership, BMW redeveloped the entire Cowley plant, demolishing much of the factory, to create a new factory and renamed this "Plant Oxford", on the site of what was historically the Pressed Steel Company's Cowley Body Plant and next door to what was historically the Morris factory. Since 2006, Plant Hams Hall produces the new Mini petrol engines, Plant Oxford is responsible for the body shell production, paint and assembly, and Plant Swindon produces body pressings and sub-assemblies, creating the "Mini Production Triangle". Mini claim that 60% of components of the Mini Mk II come from suppliers based in the UK compared to 40% for the 2001 model. The Countryman is the first modern Mini assembled outside the UK, with the contract won by Magna Steyr in Austria. At Plant Oxford 4,000 employees, referred to as "associates", produce up to 800 cars each day (approximately 240,000 per year). The bodyshop at Cowley holds 429 robots, assembling 425 body panels; the bodyshells are then moved to the neighbouring paint shop where paint robots apply the 14 exterior colour options and optional contrasting roof colours. Final assembly is performed at Cowley, which involves the fitting of 2,400 components to produce the numerous variants that may be ordered. All Prince four-cylinder petrol engines for Mini and BMW are produced at the Hams Hall Plant near Birmingham, United Kingdom, which has around 800 employees. Diesel engines are manufactured by BMW's Plant Steyr in Austria, having previously been manufactured in France and England by PSA. Mini sub-assemblies and pressings such as doors are supplied by the plant at Swindon, where 1,000 are employed and 280 pressed parts are produced using 135 welding robots. The Swindon plant was originally Swindon Pressings Ltd, founded in 1955 by the Pressed Steel Company and became a wholly owned subsidiary of the BMW Group in May 2000. Minis are primarily developed in the United Kingdom by BMW's Development Division. In 2013, assembly of the Countryman was expanded to three international locations: from April 2013 at BMW's plant near Chennai, India, specifically for the Indian market from June 2013 at the BMW Group Malaysia Assembly Plant in Kulim, Kedah, and at the BMW Manufacturing Thailand plant in Rayong from August 2013. Since 2014 cars have also been assembled under contract by VDL Nedcar near Maastricht in Limburg. A total of around 5.3 million of the original two-door Minis were sold, making it by far the most popular British car of all time. Thousands of these are still on the road, with the remaining pre-1980s versions being firmly established as collectors' items. Deliveries of Minis has ranged from 188,077 in 2006 to 232,425 in 2008. In 2009 216,538 cars were delivered, with 69.3% being Mini Hatch/Hardtop, 13.1% Convertible models and 17.6% the Clubman variant. Over 53% were the Cooper version, with 26.2% Cooper S, and the basic One 20.2%. In 2009, the Mini was Britain's seventh best selling car—the first time that a BMW-era Mini had appeared among the nation's top 10 selling cars. It also was Britain's seventh best selling car in June 2010. Mini sales worldwide were up 22% in 2011 over 2010, with 285,000 cars delivered across the globe. In the U.S., the brand's largest market, 57,000 were sold in 2011, a 26% increase over 2010. The next two largest markets, the United Kingdom and Germany, saw 13% and 28% sales increases over 2010, respectively. During the production of the post-2000 Mini, as a part of Mini's viral marketing approach, purchasers of the Mini convertible were asked to sign a "contract" promising that they would drive the car with the roof open at least 90% of the time. Mini also set up a telephone hotline (in the USA: 1-888-DO NOT CLOSE) which one may call to report convertible owners who are driving with the roof up inappropriately. The automated system offers such helpful advice as how to administer a wedgie to the offender. Butler, Shine, Stern & Partners, Mini's advertising agency, produced a video series in 2007 called Hammer & Coop, directed by Todd Phillips as part of an ad campaign for the Mini. To advertise Mini Clubman's 2008 introduction to the Chinese market, Beijing Mini offered a Mini Rickshaw, which uses the rear half of Mini Clubman. In New Zealand, Mini sponsored Mad Men, broadcast on Prime. Special spots were created; for the first season, these took the form of a satirical, sexist 60s-style television commercial. For the second season, the spot was a pastiche of Mad Men's opening credits, with a silhouette figure tumbling out of an office building, landing in the driver's seat of a Mini. It is reported that BMW was ordered by U.S. regulators to reduce fuel economy ratings on four 2014 Mini Coopers as results from EPA testing didn’t match the automaker’s submissions. In 1969, the original British Mini was featured in the gold-heist film The Italian Job starring Michael Caine and Noël Coward. In 2003, the new MINI Cooper was shown in a remake of The Italian Job. One Chilli Red MINI was a Cooper S Hatch R53, the Electric Blue MINI was a Cooper Hatch R53, and the Pepper White MINI was also a Cooper Hatch R53. The Mini E is a front-wheel drive electric car powered version of the Mini and was unveiled in 2008 at the Los Angeles Auto Show, with an electric motor rated 204 PS (150 kW; 201 hp) and 220 N⋅m (160 lb⋅ft), 380 V 35 kilowatt-hours (130 MJ) lithium-ion battery with distance of 240 kilometres (150 mi). It has top speed of 152 km/h (94 mph). The vehicle gliders are built in the Mini factory in Oxford, while batteries, electric drive and power electronics are manufactured in Munich. The components are then shipped to a specially equipped manufacturing complex, situated on BMW plant premises where the electric motor, battery units, performance electronics and transmission can be integrated. The Mini E is a demonstration car part of BMW's "Project i", which will be followed in mid-2011 by a similar trial with the BMW ActiveE (all-electric vehicle), which will be built based on the lessons learned from the Mini E field testing. The last phase of "Project i" is the development of the Mega City Vehicle (MCV) urban electric car, a new brand that will be sold separately from BMW or Mini, and is expected to go into mass production between 2013 and 2015. Field testing began in June 2009 and 450 Mini E were made available through leasing to private users in Los Angeles and the New York/New Jersey area. In May 2010 BMW announced that leasing could be renewed for another year at a lower leasing price. Another field test was launched in the UK in December 2009, where more than 40 Mini E cars were handed to private users for a two consecutive six-month field trial periods. Additional field testing is taking place in Germany and France. This trial program allowed the BMW Group to become the world's first major car manufacturer to deploy a fleet of more than 500 all-electric vehicles for private use. There were several Mini concept cars produced to show future ideas and forthcoming models such as the ACV30 in 1997 and the Crossover in 2008 which became the Mini Countryman in 2010. The ACV30 featured several elements that influenced the eventual new Mini of 2001 such as the black a-pillars, chunky wheel arch detailing and white roof. The concept was attributed to the BMW designer Adrian van Hooydonk and Frank Stephenson. BMW demonstrated a hydrogen-powered internal combustion technology in some of their concept cars in 2000 and 2001, and Mini showcased a hydrogen-powered concept car in 2001 at the Frankfurt Auto Show. The car differs from electric-motor hydrogen concepts, such as the Honda FCX in that it uses a cylinder-based internal combustion engine. An all-electric Mini is in use at the British Embassy in Mexico that uses around 200 kilograms (440 lb) of Lithium Ion batteries. Three electric Minis were also made for use in some subway scenes in the 2003 movie The Italian Job to satisfy the subway authorities concerns over possible carbon monoxide poisoning. PML Flightlink developed a prototype series-hybrid conversion, called "Mini QED", replacing the drivetrain with an 160 bhp (120 kW) electric motor in each wheel and an efficient on-board petrol generator. The Mini Cooper S won the Monte Carlo Rally in 1964, 1965 and 1967. 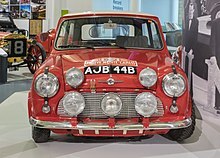 Minis were initially placed first, second and third in the 1966 rally as well, but were controversially disqualified for the use of a variable resistance headlamp dimming circuit in place of a dual-filament lamp. An R56 Challenge vehicle was entered in the 2008 Mini Challenge. The Mini Challenge Motorsport Category runs globally, with the categories in Germany, Australia, England, Spain, New Zealand, and Saudi Arabia commencing in 2010. RSR Motorsports has entered three Mini Coopers in the KONI Challenge Series Street Tuner class. On 27 July 2010 Mini announced plans to enter the World Rally Championship. The Countryman is the chosen donor model and Prodrive have been selected to prepare the Mini Countryman WRC. The factory team competed in a reduced programme for the 2011 WRC season, before cutting funding. Prodrive will still produce all specs of the Countryman WRC cars, but will self fund a reduced programme for the 2012. The original two-door Mini has won numerous awards, perhaps the most notable being: "Car of the Century" (Autocar magazine 1995), "Number One Classic Car of All Time" (Classic & Sports Car magazine 1996) and "European Car of the Century" in a worldwide Internet poll run by the prestigious Global Automotive Elections Foundation in 1999. The original Mini achieved second place for "Global Car of the Century" in the same poll (behind the Model T Ford). The Mini Cooper/Cooper S (2001–2006) won the North American Car of the Year award in 2003. The convertible model won the Most Spirited/Entry-Level category of the 2005 International Car of the Year. Following the launch of the Mk II Mini, Top Gear named the new Cooper S their Small Car of the Year 2006. The car was runner up in the 2007 World Car of the Year. In 2008 the green version of the Mini, the Mini Cooper D, was nominated for WhatGreenCar.com Car of the Year Awards. The judges commended the Cooper D for its EfficientDynamics stop-start and regenerative braking technology and were impressed by the car's driving experience. The Cooper D reached the shortlist for the Green Car Awards, but lost to the Ford Focus ECOnetic. 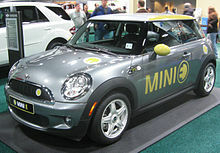 In April 2010 Kelley Blue Book included the Mini Cooper as one of its Top 10 Green Cars for 2010. Dr. Alex Moulton, the designer of the suspension system for the original two-door Mini, spoke about the new Mini in an interview with MiniWorld magazine: "It's enormous—the original Mini was the best packaged car of all time—this is an example of how not to do it. It's huge on the outside and weighs the same as an Austin Maxi. The crash protection has been taken too far. I mean, what do you want, an armoured car? It is an irrelevance insofar as it has no part in the Mini story." The Pulitzer Prize-winning automotive journalist Dan Neil has suggested that, with the introduction of the Countryman, Mini had pushed the marque beyond relevance by making a car so long, wide and tall it forsook the inner logic of the brand: excellent handling in a tiny size. In the 2013 International Engine of the Year Awards which took place on 5 June 2013, Mini won an award for its 1.6 liter four-cylinder TwinPower Turbo from the Mini Cooper S for the third time in a row in the category of 1.4 to 1.8 liter engines. The engine has "twin-scroll turbocharging with an overboost function, direct petrol injection and valve control based on the Valvetronic system" and has an output of 135 kW/184 hp and provides enough power for the Mini Cooper S to accelerate from 0-100 in 7.0 seconds and in 2013 is available for Mini Cooper S Countryman and Mini Cooper S Paceman and an ALL-4 transmission can also be added to the configuration. ^ a b c d e f g Laban, Brian (2003). The mini : the making of a modern icon (Updated ed.). London: Collins. ISBN 0-00-715275-2. ^ a b Adams, Keith; Ian Nicholls. "Mini development story Pt.2". AROnline. Archived from the original on 3 October 2011. ^ Prosser, Dan (10 November 2010). "MINI joins the World Rally Championship". London: The Telegraph. Retrieved 7 September 2011. ^ Martin, James (8 July 2009). "The Mini Cooper S Convertible: BMW know what the British like...the top down, even just for an hour". London: Daily Mail. Retrieved 7 September 2011. ^ a b c d Reed, Chris (1994). Complete Mini: 35 Years Of Production History, Model Changes, Performance Data. Croydon: MRP. ISBN 0-947981-88-8. ^ Cobb, James G. (15 September 2000). "New Mini: Retro in a Smaller Role". The New York Times. Retrieved 21 November 2010. ^ "Millionth Mini produced in Oxford". BBC News. 4 April 2007. Retrieved 21 November 2010. ^ a b "Mini Countryman (2010): first official pictures". Car Magazine. Retrieved 2 February 2011. ^ a b c d "BMW Group posts highest sales ever in 2012". BMW Group. Retrieved 15 December 2013. ^ Reed, Chris (2003). Complete Classic Mini 1959–2000. Orpington: Motor Racing. ISBN 1-899870-60-1. ^ Martin Buckley & Chris Rees (2006). Cars: An encyclopedia of the world's most fabulous automobiles. Hermes House. ISBN 1-84309-266-2. The BMC Mini, launched in 1959, is Britain's most influential car ever. It defined a new genre. Other cars used front-wheel drive and transverse engines before but none in such a small space. ^ Strickland, Jonathan. "HowStuffWorks "How the MINI Cooper Works"". Auto.howstuffworks.com. Retrieved 20 July 2010. ^ "Future of Monte Carlo rally in doubt". BBC. 21 January 1961. ^ a b BMWism com automotive design information. "BMW Car Designers". Bmwism.com. Retrieved 6 June 2014. ^ Ledward, Sally (4 October 2000). "End of an era as Mini production is halted". London: The Independent. Retrieved 12 January 2012. ^ a b "Longbridge says goodbye to its little wonder". London: The Telegraph. 5 October 2000. Retrieved 12 January 2012. ^ Edwardes, Charlotte (8 July 2001). "King's Road hails return of the Mini". London: The Telegraph. Retrieved 12 January 2012. ^ Madslien, Jorn (15 February 2005). "BMW cash to fuel Mini production". BBC News. Retrieved 12 January 2012. ^ "BMW's £100m boost for Mini as sales accelerate". The Scotsman. 17 February 2005. Retrieved 12 January 2012. ^ "Mini to build 2-door sporty crossover". Detroit Free Press. 10 January 2011. Retrieved 24 November 2011. ^ "Mini Paceman Concept Confirmed for Production". The Miami Herald. 12 January 2011. Retrieved 24 November 2011. ^ Reiter, Chris (9 June 2011). "BMW Plans to Invest 500 Million Pounds for Mini Assembly". Bloomberg. Retrieved 24 November 2011. ^ "BMW to invest £500 million in UK on new Mini". Reuters. 9 June 2011. Retrieved 24 November 2011. ^ "Buying secondhand: Minis". Autocar. 145 (4172): 74–77. 23 October 1976. ^ "The History of Mini". GearHeads. 19 May 2012. Retrieved 18 November 2012. ^ "Evo Magazine December 2007". Evo.co.uk. 6 December 2007. Retrieved 25 June 2011. ^ Martynn Randall. (2005). MINI Owners Workshop Manual July 2001 to 2005 (Y to 05 reg) Petrol. Sparkford: Haynes. ^ Mini Cooper: service manual, Mini Cooper, Mini Cooper S, 2002, 2003, 2004. Cambridge, MA: BentleyPublishers.com. 2004. ISBN 0-8376-1068-0. ^ Gary Anderson; Don Racine (1982). Motoring: Getting the Maximum from Your New MINI. Los Altos, Calif.: Enthusiast Publications. ISBN 0-9765780-0-X. ^ "Evo Magazine December 2006". Evo.co.uk. 8 December 2006. Retrieved 25 June 2011. ^ "BMW Group Research and Innovation Center". BMW Group. Retrieved 18 November 2012. ^ "BMW Group Research and Technology". BMW Group. Retrieved 18 November 2012. ^ Nunez, Alex (14 August 2007). "Frankfurt Preview: Mini's track-prepped John Cooper Works Challenge". Autoblog.com. Retrieved 17 November 2010. ^ Paukert, Chris (6 October 2009). "Officially Official: Mini Cooper JCW World Championship 50 details and photos released". Autoblog.com. Retrieved 17 November 2010. ^ Nunez, Alex (11 January 2009). "Detroit 2009: Mini Cooper Convertible chills out". Autoblog.com. Retrieved 17 November 2010. ^ Joseph, Noah (10 February 2009). "Geneva Preview: Mini drops the top on the JCW cabrio". Autoblog.com. Retrieved 17 November 2010. ^ "2009 Mini Convertible Photos and Specs Released". Wot.motortrend.com. Retrieved 17 November 2010. ^ Noah Joseph (15 September 2009). "Frankfurt 2009: Mini Coupe & Roadster Concepts". Autoblog.com. Retrieved 12 February 2012. ^ Zach Bowman (27 January 2012). "2012 Mini Roadster priced from $24,350*". Autoblog.com. Retrieved 12 February 2012. ^ Phillips, Tom; Rix, Jack (January 2011). "Detroit Motor Show: MINI Paceman gets green light". AutoExpress. Dennis Publishing. ^ "Mini Paceman arrives next year". AOL Autos. July 2012. ^ Burt, Matt (27 September 2012). "Paris motor show: Mini Paceman". Autocar. Retrieved 10 June 2013. ^ Berkowitz, Justin (1 November 2013). "2014 Mini Cooper and Cooper S: Envelope Pushed, Again". caranddriver.com. Retrieved 22 December 2015. ^ "BMC ADO 15" (PDF). Automobile Engineer. April 1961. Archived from the original (PDF) on 10 May 2015. Retrieved 25 March 2012. ^ Parnell, John; Clausager, Anders Ditlev (2002). Hughes, Mark (ed.). Original Mini Cooper and Cooper S: The Restorer's Guide. photography by Paul Debois. St. Paul, Minnesota: Bay View Books. ISBN 0-7603-1228-1. ^ "Development codes". AR Online. Retrieved 25 March 2012. ^ "Mini Product Numbering System Explained". MotoringFile. Retrieved 29 January 2007. ^ "MINI Coupe and Roadster will be discontinued after 2015". ^ Benny (10 January 2011). "MINI Paceman läuft ab 2012 in Graz vom Band, Marktstart 2013" [MINI Paceman production runs from 2012 in Graz, market launch 2013]. Bimmer Today (in German). Retrieved 25 June 2011. ^ Kacher, Georg (27 January 2012). "BMW's plan to replace whole Mini range". carmagazine.co.uk. Retrieved 19 June 2013. ^ Gillian Bardsley, Stephen King (2006). Making Cars at Cowley. Tempus Publishing. ISBN 0-7524-3902-2. ^ "Mini Production Triangle official website". Mini-production-triangle.com. Retrieved 25 June 2011. ^ "Agency posts axed at Oxford's Mini plant". BBC News. 15 September 2010. Retrieved 5 February 2011. ^ "BMW Group". BMW Group. Retrieved 25 June 2011. ^ "German Ambassador visits Hams Hall engine plant". Birmingham Post. 13 November 2009. Retrieved 21 November 2010. ^ "About 100 jobs to go at Swindon Mini plant". BBC News. 9 February 2010. Retrieved 21 November 2010. ^ "BMW Group website". Bmwgroup.com. Retrieved 25 June 2011. ^ "Contact and FAQs". Mini USA. Retrieved 20 December 2010. ^ BS Reporter (18 April 2013). "BMW to make MINI Countryman in Chennai". business-standard.com. ^ "Mini voor Amerika ook uit Nederland". TMG Landelijke Media B.V., Amsterdam (Autovisie). 12 March 2014. Retrieved 1 June 2017. ^ "REPORT OF THE MANAGEMENT BOARD ... Products and production volume" (PDF). ANNUAL REPORT 2015. VDL Nedcar B.V. (VDL Nedcar). 1 June 2017. p. 8. Retrieved 19 July 2015. ^ "BMW Chief Plans 'Big Push' to Fend Off Audi, Mercedes". Bloomberg Businessweek. 7 September 2010. Retrieved 21 November 2010. ^ "BMW Group Annual Report 2009" (PDF). Archived from the original (PDF) on 5 July 2010. Retrieved 25 June 2011. ^ "Ford Fiesta is top in 09". Car Dealer Magazine. 8 January 2010. Archived from the original on 21 May 2010. Retrieved 13 May 2010. ^ "British car sales up 20% in a year". The Sun. London. 6 July 2010. Retrieved 5 August 2010. ^ "Mini roadster debuts amid monster sales". Detroit Free Press. ^ Filipponio, Frank (20 February 2007). "Hammer & Coop: Episodes 1 & 2". Autoblog.com. Retrieved 19 June 2009. ^ "Video: Counter Counterfeit Mini Coopers". Theory.isthereason.com. 29 October 2005. Retrieved 17 November 2010. ^ Korzeniewski, Jeremy (8 August 2008). "Mini Clubman Rickshaws running around Beijing". Autoblog.com. Retrieved 17 November 2010. ^ Burden, Melissa (13 May 2016). "GM halts large SUV sales due to fuel economy labels". The Detroit News. Retrieved 14 May 2016. ^ Abuelsamid, Sam (18 November 2008). "LA 2008: Live reveal of the Mini E". Green.autoblog.com. Retrieved 17 November 2010. ^ Abuelsamid, Sam (18 October 2008). "LA Preview: Officially, official: the Mini E!". Autobloggreen.com. Retrieved 17 November 2010. ^ a b Tom Murphy (19 May 2010). "Mini E Only Beginning of BMW EV Strategy". Wards Auto. Retrieved 13 June 2010. ^ Joe Lorio (May 2010). "Green: Rich Steinberg Interview". Automobile Magazine. Retrieved 12 June 2010. ^ a b "Mini Says Half of Last Year's Mini E Lessees Renewed for Another Year". Edmunds.com. 12 May 2010. Archived from the original on 18 May 2010. Retrieved 12 June 2010. ^ Phil Patton (3 July 2010). "Envisioning a Small Electric BMW for the World's Very Big Cities". New York Times. Retrieved 3 July 2010. ^ "BMW and UC Davis Partner on MINI E Study". Green Car Congress. 14 August 2009. Retrieved 25 December 2009. ^ "Half of Mini E lessees renew for another year, price dropped to $600/month". AutoblogGreen. 14 May 2010. Retrieved 12 June 2010. ^ "BMW Delivers 40 Electric MINI E Cars for UK Trial". Green Car Congress. 14 December 2009. Retrieved 25 December 2009. ^ Zaher Karp (May 2010). "Upcoming Munich MIni E Trial". PluginCars.com. Retrieved 12 June 2010. ^ Chris Wright (3 June 2010). "UK: Harsh winter provides valuable Mini EV feedback". Just Auto. Retrieved 13 June 2010. ^ Jim Motavalli (19 May 2010). "BMW's Hybrid Future May Include 3 Series". New York Times. Retrieved 13 June 2010. ^ Peter Whoriskey (24 December 2009). "Recharging and other concerns keep electric cars far from mainstream". Washington Post. Retrieved 25 December 2009. ^ "Car Design News 3 February 2009". Cardesignnews.com. Archived from the original on 8 July 2011. Retrieved 25 June 2011. ^ "Monte Carlo Automobile Club". Acm.mc. Retrieved 11 October 2010. ^ "Event Information - Entry List". Grand-am.com. 3 June 2009. Archived from the original on 11 July 2011. Retrieved 19 June 2009. ^ Graham Robson (2002). New Mini. Newbury Park, Calif.: Haynes North America. ISBN 1-85960-874-4. ^ "KBB Green: Top 10 Green Cars for 2010". Kelley Blue Book. April 2010. Archived from the original on 24 April 2010. Retrieved 2 May 2010. ^ "KBB's green cars list includes VW Golf TDI, Chevy Tahoe hybrid". USA Today. 20 April 2010. Retrieved 2 May 2010. ^ "Alex Moulton". MiniWorld. Retrieved 24 April 2006. ^ Dan Neil (5 March 2011). "What Part of 'Mini' Did You Not Grasp, BMW?". The Wall Street Journal. ^ "Two reasons for the BMW Group to celebrate in the 2013 Engine of the Year Awards. Class victories for the 2.0-litre engine with BMW TwinPower Turbo technology and the 1.6-litre unit in the MINI Cooper S." BMW AG. 5 June 2013. ^ "BMW Group Receives Two "Engine of the Year Awards" 2013". CARSPECWALL.COM. 5 June 2013. ^ "BMW Enjoys Two Class Wins at 2013 Engine of the Year Awards". AUTOSVENUE.COM. 10 June 2013.